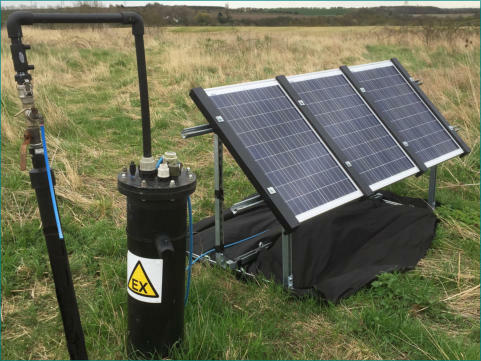 SOLAR PUMPS The SQFlex pump range consists of 10 different pump sizes: 4 helical rotor pumps for medium to high heads & low to medium flow. 6 centrifugal pumps for shallow heads and high flows. Made from AISI 316 stainless steel for more aggressive waters the pump is fitted with a high efficiency motor for DC or AC voltage. SOLAR PANELS The GF solar panels are designed especially for the SQFlex pump motor unit. A higher output voltage compared to standard 12V panels ensures optimum efficiency of the complete SQFlex pump system. COMBI SYSTEMS The SQFlex Combi takes maximum advantage of natural energy resources by providing a combination of solar and wind energy. Solar panels for when the sun is shining and a wind turbine for when the wind is blowing, providing greater reliability and pumping.